THE SNICKERS ADVERTISING campaign featuring celebrities like model Katie Price, singer Cher Lloyd and footballer Rio Ferdinand may be breaking the law, according to Britain’s trading watchdog. Britain’s Advertising Standards Agency said it could not investigate complaints about the Snickers campaign until one was received, however. The campaign first came to prominence when model Price – better known as Jordan – tweeted a string of comments about the global sovereign debt crisis, focussing particularly on Chinese monetary policy. Similar tweets have since been posted by Rio Ferdinand (“Can’t wait 2 get home from training and finish that cardigan”, after professing his love for knitting) and former cricketer Ian Botham, who said he was learning to play the cello. Boxer Amir Khan tweeted about his latest travails in stamp collecting, while X Factor singer Cher Lloyd spoke of her love for Russian literature (“Chekov really captures the human condition!! Yay!!!”). 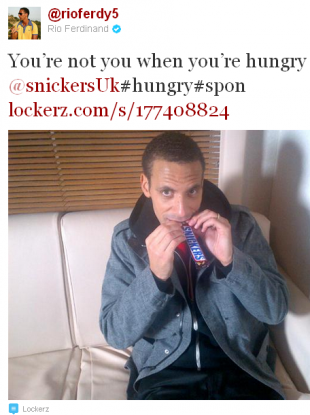 Email “UK trade watchdog warns Snickers over celeb 'tweet-vertising'”. Feedback on “UK trade watchdog warns Snickers over celeb 'tweet-vertising'”.